Donald James (Don) Grimes was born in Albury, New South Wales, on 4 October 1937. He was the only son and eldest of two surviving children of Walter John Grimes, a fitter and turner with New South Wales Railways, and his wife Annie Mildred (Nancy), née O'Neill, who was a nurse before her marriage. Nancy Grimes died of bowel cancer when Don was in his early teens. Don attended a local state primary school and received the first three years of his secondary education at Albury High School. Despite the lack of books at home—one of the few publications in the Grimes' household was Hansard—he was an avid reader, assisted by the municipal librarian who encouraged adolescents to read contemporary literature. After his mother's death Don and his sister went to Sydney to live with an aunt in Stanmore, and he completed his secondary education at Fort Street High School. At school he was an outstanding and versatile sportsman, excelling in athletics, rugby union and water polo. In his first year he played in the second row for the A grade premiership-winning rugby union team. On weekends he played in an Australian Rules competition, and later, junior rugby league for North Sydney. Though more committed to sport than scholarship, he matriculated in 1954 with good results. Grimes applied for and was accepted to study medicine at the University of Sydney, completing his clinical training at the Royal North Shore Hospital. Inheriting his father's sense of egalitarianism, Grimes brought a left-wing perspective to campus discussions of political and social issues. He also attended meetings organised by the Labor Club but did not join. Taking advantage of his tall frame, he represented the university in Australian Rules football, playing at the Intervarsity Carnival in Adelaide in 1956. Grimes married Margaret Lynne Schofield in Sydney on 5 March 1960; they had two daughters and two sons. Graduating as an MB BS in 1962, Grimes completed his internship at Royal Hobart Hospital. He served subsequently as resident and registrar at the Royal Hobart before acquiring further experience as a general practice locum in Hobart, New Norfolk and Launceston. In regional Tasmania Grimes encountered patients far less privileged than was the norm at Royal North Shore. He observed the debilitating effects of poverty, domestic violence and illegal abortions. Intending to train as a specialist physician, Grimes embarked with his young family for London in mid-1965, where he accepted a position as in-house doctor for the Beaverbrook Press. Struck by the pervasiveness of class consciousness in the United Kingdom, he joined the British Labour Party, which provided access to continental social democrats and activists from South America and Africa. His first-hand experiences of European social democracy in Austria, France, the Netherlands, Scandinavia and Germany, helped shape his vision of a more communitarian Australia; it also inoculated him against utopian expectations of left-of-centre governments. With Margaret pregnant with their third child, Grimes returned to Tasmania in 1966. He served as district medical officer at Cygnet, south of Hobart, before beginning a general practice in the conservative Launceston suburb of Riverside. For Grimes, the Vietnam War served as an impetus for renewed political activism. He joined the Australian Labor Party in 1968 and later became a foundation member of the Riverside branch. Grimes was branch secretary for six years from 1972 and, between 1973 and 1974, served on the Tasmanian ALP's Constitution and Rules Committee. His election to the Senate in 1974 was aided by good fortune. As a candidate was needed from Northern Tasmania, Grimes had been preselected for the half-Senate election due in 1975, and was placed in the unwinnable third spot on Labor's ticket. However, that election was superseded by the double dissolution election of May 1974. When the second-placed Labor Senate candidate withdrew, Grimes found himself unexpectedly propelled into fifth position on the party ticket for the full Senate poll. He was the eighth of ten Tasmanian senators elected. The new senator received a day's notice that he would deliver his first speech as seconder of the motion for the adoption of the Address-in-Reply on 10 July 1974. Grimes wrote his text that night, alone in his room at Canberra's Kythera Motel. Next day, just as he was about to speak, a senior Labor colleague, Attorney-General Lionel Murphy deftly removed his draft, telling him he would perform better thinking on his feet. There is scant evidence in Hansard that Grimes was noteless and petrified. His speech argued for social democratic reform, with a particular emphasis on health, foreign policy, decentralisation and resource ownership. He scorned conservative resistance to change, depicting it as the perennial response of those with unwarranted advantages. He linked this to the contentious issue of Medibank, undercutting some of the most virulent criticisms that had originated from financially privileged groups. Grimes would later suggest that fellow members of the medical profession suffered from an overweening sense of superiority. He concluded by expressing his vision of an Australian future where 'people should have the freedom and the opportunity to realise their reasonable ambitions without being exploited by others or indeed without exploiting others'. Grimes' appetite for political combat accounted for the frequency of his Senate contributions. At the historic joint sitting of the Senate and House of Representatives in August 1974, held to resolve a legislative deadlock between the two houses, Grimes, with less than a month of parliamentary experience, participated in the debate on the Whitlam Government's two Medibank bills: the Health Insurance and the Health Insurance Commission bills. He asserted that health care was a core element of social security and therefore justly entitled to be funded from progressive taxation. Grimes drew on his experience as a general practitioner to challenge arguments that the bills amounted to 'communism, conscription and fascism'. Although Grimes' debating prowess impressed Prime Minister Gough Whitlam, Whitlam remained wary of Grimes' independent streak. For example, late in 1975, Grimes infuriated Whitlam by supporting a recommendation of the Constitutional and Legal Affairs Committee that a national compensation scheme, dear to the prime minister's heart, required substantial modifications. Labor's misfortunes of 1975—the Bass by-election defeat in June, the Opposition's deferral of supply in October, the dismissal of the Whitlam Government in November, and its stinging electoral rebuff in December—took their toll. Grimes had been asked to stand as a candidate for Bass but refused. He knew that Labor was doomed to failure and, in a typically unflinching analysis of the by-election defeat, attributed the government's electoral decline since 1972 to the disunity, extravagance and vulgarity of some of its ministers and the unpopularity of the prime minister. In the party ballot to determine placement on Labor's Tasmanian Senate ticket for the 13 December 1975 double dissolution election, Grimes outpolled his mentor and fellow first-term senator, Mervyn Everett to take fourth position, consigning Everett to the vulnerable fifth place. Although Everett won a larger primary vote, the flow of preferences down the ticket ensured that Grimes retained his seat as the last of ten Tasmanian senators to be elected. In January 1976 the first federal Caucus meeting after the defeat of the Whitlam Government saw Grimes elected to the Opposition front bench. He became the shadow minister for social security; he also had responsibility for repatriation and compensation (renamed veterans' affairs in 1977). Grimes fully immersed himself in his shadow social security portfolio through policy development and biting critiques of the government. Conscious that the portfolio represented nearly thirty per cent of the federal budget, Grimes crisscrossed the country to consult interest groups and led the development of the ALP's social security election platforms. He reached a wide audience by publishing in books and journals. In Labor: Directions for the Eighties he set out his plans for fundamental social security reform which included replacing the Coalition's view of benefits as a privilege with the Labor conception that they were a right, to enable all Australians to live in freedom and dignity without regard to their economic circumstances. In the lead-up to both the 1980 and 1983 elections Grimes issued social security bulletins highlighting Labor's welfare policies and what he saw as the deficiencies of the Fraser Government in the area. Grimes was quick to condemn the Fraser Government over its harsh treatment of social security beneficiaries in the so-called 'Greek Social Security Conspiracy Case' which began with highly publicised Commonwealth police raids on the homes of Greek pensioners and on doctors' surgeries in March 1978, amid claims of a widespread conspiracy to defraud the Department of Social Security. A month later Grimes raised the issue in the Senate as an urgency motion, arguing that the manner in which the case was being prosecuted presumed guilt instead of innocence, discriminated against Greeks and damaged relations with the Greek community. He pursued the matter doggedly throughout the remainder of his tenure as shadow minister. By the end of 1982, as a result of the failure of the conspiracy cases and revelations of police and departmental bungling, he had orchestrated a wave of damaging publicity against the Fraser Government. By the early 1980s Grimes had already consolidated his position as an influential figure in the ALP. He was a Tasmanian delegate to the ALP's national conference in Perth in July 1977 where, with the likes of fellow pragmatists John Button and Peter Walsh, he set about rebuilding the federal ALP into an electable alternative government. At the December 1977 half-Senate election he headed the ALP's Tasmanian ticket. He also served as state vice-president of the party (1979–80) and in December 1980, with the backing of Opposition Leader Bill Hayden, he was elected Deputy Leader of the Opposition and Manager of Opposition Business in the Senate. In 1982 the ALP National Executive intervened in the ailing Tasmanian branch and appointed Grimes state president, a peacemaking role he accepted reluctantly. Fellow Labor senator Michael Tate later said that during his term as state president Grimes had 'experienced isolation, and a good deal of pain and hurt' from those who had been his colleagues in Tasmania. Although his heart and state affiliations resided with the Left faction, under the stewardship of the newly elected Prime Minister Bob Hawke, Grimes sometimes used his pivotal swinging vote to support the prime minister against the Left. Graham Richardson later wrote that 'no one was quite sure where he [Grimes] stood factionally' and Grimes thought of himself as simply a pragmatic social democrat, who could not be coerced. Following Labor's election victory in March 1983, Grimes was appointed Minister for Social Security in the Hawke Government. He held that portfolio until the election of December 1984 after which he was appointed to the newly-established role of Minister for Community Services. In 1983 Grimes satisfied a pre-election commitment by establishing the Disability Advisory Council of Australia, which provided a mechanism for disabled people to directly advise the government. This initiative was closely followed by the Handicapped Programs Review (HPR) (1983–85) and its legislative outcome, the Disability Services Act 1986. The HPR involved a comprehensive public examination of government social policy as it affected the disabled. The review was based on the principle that future government funds should be directed towards services and programs that provided the individual with the greatest amount of flexibility. The resulting report, New Directions, highlighted existing shortcomings in provisions for the disabled, including segregation, institutionalisation, lack of choice and Dickensian-style sheltered workshops. The report's recommendations reflected, in Grimes' words, 'the aspirations of people with disabilities who want independent living options, realistic training and employment opportunities and better access to ... mainstream community services'. Grimes' crowning ministerial achievement was the enactment of the Disability Services Act 1986. The measure was testimony to his readiness to challenge the opinions of professionals and organisations when he felt that those opinions did not serve the best interests of stakeholders. Despite the opposition of some service providers, there was bipartisan support for the Act which, for the first time, linked government funding of organisations to specified outcomes for their disabled clients. In his second reading speech Grimes emphasised that the bill represented a 'new deal' for people with disabilities and provided 'a proper recognition of their rights and dignity and opportunity for the fullest possible participation in the community'. Grimes' regard for the dignity of minorities was also apparent in his significant contribution to the Government's effective and enlightened response to the appearance of AIDS in the early 1980s. He calmly answered the first parliamentary question on AIDS in May 1983 and took the early lead in convincing Cabinet that the issue warranted an urgent science-based policy response. 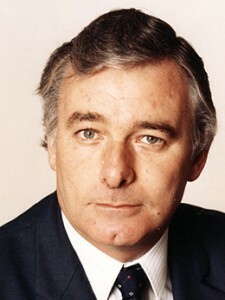 Between 1983 and 1984 Grimes undertook the most controversial task of his ministerial career: the re-imposition of an assets test on pensions which the Fraser Government had replaced by a more generous 'income test' in 1976. He faced intense and sustained fire from sections of the ALP itself, the Opposition, the media and pensioner organisations with criticisms ranging from political accusations that the government was seeking to 'grind down the elderly', to media claims that the test amounted to a bureaucratic, intrusive, unfair 'tax on thrift'. Throughout the controversy Grimes steadily maintained that the assets test was an essential part of a needs-based social security system, that most pensioners would be unaffected and that its reintroduction would counter the myriad income tax avoidance schemes that had sprung up after its abolition. Grimes held his nerve, making only minor adjustments as anomalies emerged. In 1986 Grimes disagreed vehemently with the Hawke Government's proposed changes to media ownership rules (adopted in 1987), believing that the changes favoured established television interests and would reduce diversity. But the major disappointment of his ministerial career was the government's failure to accomplish fundamental taxation reform, which, in an era of fiscal austerity, severely curtailed his ministerial scope. Grimes had long admired the capacity of European social democratic governments to redistribute wealth through consumer and indirect taxes. He argued that radical social policy reform in Australia required prior reform of the tax system, including increased indirect taxation and a crackdown on tax avoidance. He regarded the ALP Left and the welfare lobby as particularly obtuse in demanding Scandinavian social security provisions without accepting the need for a corresponding level of taxation. Grimes' relationship with the ALP Left did not improve while in government. In 1984 he branded them paranoid, authoritarian, doctrinaire and obsessed with symbolic issues. In 1986 Grimes told a journalist that the true left was 'about redistribution of power and wealth and creating a more equal and fair society'. Grimes looked beyond the domestic party, choosing to cultivate international links that he had forged initially in Europe during the 1960s. For a decade from 1977 he had represented the ALP at congresses of the Socialist International and had become friendly with some of its notable leaders, including Sweden's Olof Palme and West Germany's Willy Brandt. Following Palme's assassination in 1986, Grimes was invited to represent the Australian Government at the funeral in Stockholm. The gregarious political life, long hours, constant travel and crushing workload eventually took their toll on Grimes. His first marriage had ended in divorce. He married again on 14 August 1984, but this marriage to Helen Knight also failed. A smoker and drinker for thirty years, his health had deteriorated and, in mid-1985, he suffered a heart attack at Parliament House. A triple bypass operation and eight days in hospital ensued. Grimes replaced his ministerial desk with a lounge chair and coffee table, evicted files from his office, stopped smoking, cut down on alcohol and resumed swimming. Tired of politics, Grimes announced in September 1986 that he would be retiring from the Senate when his term expired in the following April. After leaving the Senate Grimes served as Australia's Ambassador to The Netherlands (1987–91), where he chaired a World Health Organisation committee on AIDS in prisons. During his term he met Esther Timmermans, who became his third wife in 1991. When Grimes returned to Australia, he served as a senior member of the Administrative Appeals Tribunal (1991–96), and chaired the Australian National Council on AIDS (1992–96), the South Eastern Sydney and Illawarra Area Health Service (1995–2003) and Aus Health International (1997–2003). Between 1997 and 2003 he was the director of the oncology centre at the Gleneagles Hospital in Kuala Lumpur, Malaysia, and for the next two years he was the principal advisor to the Bahraini health minister. It was a measure of Grimes' standing with his parliamentary colleagues that his appointment to a diplomatic post received bipartisan support. For a politician associated with some divisive issues he attracted remarkably little rancour. The Sun-Herald was typical in describing him as 'an affable workhorse'. Senator Michael Tate dubbed him the 'quiet revolutionary' for his contribution to social policy and Cabinet colleague Neil Blewett considered Grimes to be 'the architect of much of Labor's social reform agenda'. Labor's female senators were among his greatest admirers. Rosemary Crowley numbered him among 'the very strong feminists' of her acquaintance, while Susan Ryan acknowledged his 'enormously effective new programs' for the disadvantaged, and the provision of 40 000 new childcare places, stating: 'He has done all of those things without great fuss, without pomposity or high-flown rhetoric ... he is kind, decent and humane'. In his farewell speech to the Senate, Grimes spoke of the need 'to develop a more loving and caring society', even as he acknowledged the cynicism that such an aspiration could evoke. In 1992 Don Grimes was appointed an Officer of the Order of Australia for his services to the Australian Parliament and to international relations. When he reflected on his career later that year he took particular satisfaction in what he had achieved for people with a disability. By inviting them, for the first time, into the public policy process, he had helped set in motion a self-perpetuating wave of rising expectations. He was aware that not all expectations could be met in the short term; nevertheless he took comfort from Olof Palme's observation that rising expectations were the hallmark of a successful democracy. 'Dr Don Grimes—a biographical profile', Australian Disability Review, No. 1, 1992, p. 14; Fort Street High School, The Fortian, Dec. 1953, p. 41, Dec. 1955, p. 7; CPD, 27 Nov. 1985, pp. 2427–30; SMH, 31 Aug. 1991, p. 23; Mercury (Hob. ), 30 April 1974, p. 3, 5 July 1982, p. 7; John Best, Portraits in Australian Health, MacLennan & Petty, Syd., 1988, pp. 209–13. CPD, 10 July 1974, pp. 36–8, 12 June 1975, pp. 2621–3; CPD (R), 19 Feb. 1976, p. 123–8, CPD (J), 7 Aug. 1974, pp.112–14; SMH, 23 March 1983, p. 6; John Hurst, Hawke: The Definitive Biography, A&R, London, 1975, p. 193. SMH, 9 Jan. 1976, p. 2, 28 Jan. 1976, p. 2, 23 March. 1983, p. 6; John Button, As It Happened, Text Publishing, Melb., 1999, pp. 159–60, 172; Don Grimes, 'The Disability Services Act—lessons for the future', Australian Disability Review, No. 1, 1992, pp. 2–3; Don Grimes, Physically Disabled People in Australia: A Discussion of Present Provisions and Directions for Future Policies, Canberra, 1980; CPD, 5 March 1981, pp. 356–60, 6 Sept. 1983, pp. 325–6; Don Grimes, 'Security', in Labor: Directions for the Eighties, J. North and P. Weller (eds), Ian Novak, Syd; 1980, pp. 151, 154–5. pp. 1403–8, 21 March 1979, pp. 809–13, 14 Nov. 1979, pp. 2249–52, 16 Dec. 1982, pp. 3650–1, 29 Feb. 1984, pp. 172–3, 11 March 1986, pp. 747–8, 2 April 1987, pp. 1715–16, 1722–3; Don Grimes, 'Social security "conspiracy" case—a review', Australian Quarterly, Vol. 2, No. 2, 1980, pp. 128–43; Mercury (Hob. ), 8 Dec. 1977, p. 5, 5 July 1982, p. 7. CPD, 19 Oct. 1983, pp. 1712–13, 30 May 1985, pp. 2776–8, 12 June 1986, pp. 3829–33, 4 May 1983, p. 151, 12 Nov. 1986, pp.1979–84; Handicapped Programs Review, New Directions, AGPS, Canberra, 1985. CPD, 1 March 1984, pp. 210–11, 1 June 1984, pp. 2347–52; CPD (R), 25 Aug. 1983, pp. 315–22; Courier-Mail (Brisb. ), 15 Nov. 1984, p. 4, 19 Nov. 1984, p. 4; Grimes, 'Security', pp. 148–50; Don Grimes, 'Social Policy Requirements', Labor Forum, Vol. 4, No. 4, Dec. 1982, p. 10; SMH, 10 June 1986, p. 15. SMH, 31 Aug. 1985, p. 7, 3 June 1986, p. 7, 10 June 1986, p. 15, 30 Oct. 1986, p. 19; Alan Ramsey, The Way We Were: The View from the Hill of the 25 Years That Remade Australia, UNSW Press, Kensington, NSW, 2011, pp. 53–4, 74–5; Best, Portraits in Australian Health, pp. 213–14. CPD, 2 April 1987, pp. 1716–25; Neal Blewett, A Cabinet Diary, Wakefield Press, Adel., 1999, p. 111; Sun-Herald (Syd. ), 12 Oct. 1986, p. 51; Don Grimes, 'The Disability Services Act—Lessons for the Future', Australian Disability Review, No. 1, 1992, p. 11. This biography was first published in The Biographical Dictionary of the Australian Senate, Vol. 4, 1983-2002, Department of the Senate, Canberra, 2017, pp. 323-328.